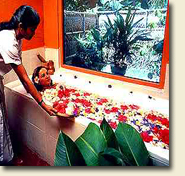 Royal Wheels India is an adventure travel group organising Ayurveda Tours Package in India. Arrive Cochin International Airport. On arrival, drive directly to Thekkady (5 hours) and check into Spice Village. Overnight stay. Go on a boat safari in Lake Periyar. Herds of playful wild elephants have made Periyar Lake their favourite haunt for frolicking in the water. Scores of them can be witnessed bathing and swimming here. Later visit a Spice Plantation. Overnight at Stay. inter-linked with hundreds of winding canals. Check-in at Coconut Lagoon. Go on a sunset cruise in the evening. Overnight Stay. Visit the bird sanctuary in the morning. On the western side of the Vembanad Lake, Kumarakom is famous for the seasonal migratory birds that come to this bird sanctuary in their respective seasons. Also visit a Farm House. Overnight Stay. Around noon, transfer to Mararikulam (45 minutes) a famous beach resort of Kerala. Check into the Marari Beach Hotel. Rest of the day leisure by beach. Overnight stay. Full day at leisure on the beach. Overnight Stay. After breakfast drive to Cochin (1 hour 15 mins). Check into Casino Hotel. Go on a sightseeing tour and harbour cruise in the evening. Overnight Stay.